Darpa is researching soft robots to be used to gain covert access to denied or hostile space during combat. 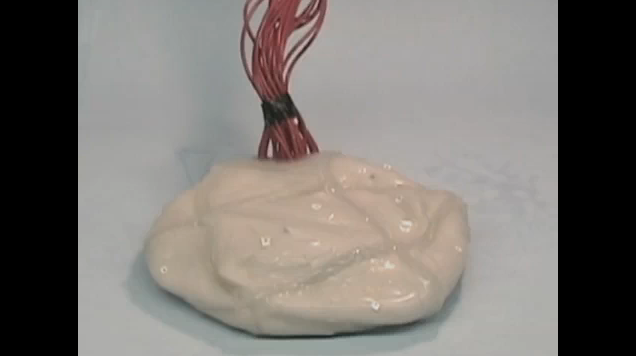 The video above demonstrates just one example of such a chem-bot, which moves through fluctuating levels of air inside pockets of expandable rubber skin. Through this technology, the robot is able to go from a rigid to a fluid-like state and shift shape considerably to go through openings smaller than itself. Amazingly, it also looks very similar to Cronenberg’s conception of bio-technology in Existenz. This is extremely relevant to our previous discussions about a technology that could repair damage after natural disasters and catastrophic events. Other than war scenarios, earthquake rescue operations is one of the more positive applications proposed for this technology. As we discussed earlier, I think the real breakthrough in technology will not be based on developments of current technology, but on something that mimics biological systems. This could be how we start to imagine our system of “instant architecture”. This entry was posted in automated environments, bio-technology, Darpa, disaster, DNYBLE, robots, swarm, technology. Bookmark the permalink. Yes. And furthermore, it has different states of activation, and it’s using the most abundant and universal material to operate: air. This allows it to operate similarly throughout the globe, but it also keeps it native to the earth exclusively.